There are tons of blogs around about children’s books, but so far most of them have been written by adults. But now junior bookworms are having their say as children start to blog about the books they love reading. 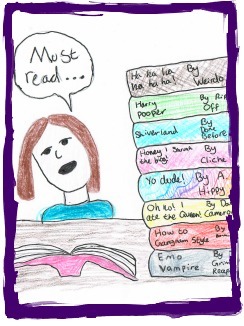 We think it’s really cool when children blog about the books they read. Blogs like this are a great way to tell the world about a book you’ve enjoyed, or to get ideas for books you might like to read, or just to find other bookworms like you. And if you’re an adult wanting to find ideas for books for your child to read, book blogs written by children are a great place to look. Not so much from the horse’s mouth as from the bookworm’s eyes. What Should I Read Next? is a fascinating book review blog for tweens and teens written by 14-year-old bookworm Maya from Wales. What Ruby Read Next – Thirteen year old Ruby addresses the difficult question of what to read when you’re too old for children’s books but too young for adult literature. Flea Reads – This one is unique because it’s the only video blog on our list. Seven year old bookworm Flea reports on the books she loves and hopes you will too. Childtastic Books – A co-written blog from nine year old Holly and her mum Sam. As well as book reviews, they chew the fat about reading-related issues. The Turtle of Happiness – Nine year old Mr Turtle is planning to review every book he reads, and has even had a visit from the author of one of his favourite Doctor Who books. SpiderSpider – This talented nine year old boy has a great eye for a funny book, as he reports on reading and other adventures. Mini Bookworms – A collective of parent bloggers and their children who love to read. And if you want to encourage a young reader today, go visit some of these blogs and leave a comment. You might just pick up some ace reading suggestions as well. Bloggers – if you are on this list feel free to pick up your Brilliant Blog Badge which is over here on the badge page. And if you know of any more child book bloggers (or you write one), leave the address in the comments box below and we will include you in a future roundup. By the way, if you’re a young bookworm who wants their reviews to reach a wider audience, check out The Guardian’s children’s books site where you can join in and get your reviews published. Remember, reading is cool! And blogging about reading is a double volume of cool! Wow, thankyou!! Glad you like my blog, and by the way all the other blogs on here are outstanding! Thank you Ruby. Your blog is terrific, it’s clear you’ve put a lot of time into it. Good luck in your future blogging adventures and happy reading! CONGRATS to my simply amazing friend Ruby who’s on this list 🙂 Well done Ruuu! Once you consider a children’s book, global it was just developed in one sitting. The language used have become easy, illustrations are uncomplicated, And also the story is simple. But when you think it is, grown-up who would like to write a children’s book must think and feel being a six-year-old would. Is the fact an easy task to do? If you are somebody that is obviously youthful generation, writing a children’s book might be a fun activity. Check out these five points to writing a children’s book. I can’t thank you enough Joanne. Book reviews written by kids! What a great idea. Instead of parents guessing if their children liked the books or not you get the reviews directly from your audience. As a children’s books author I think these blogs will be very helpful and you’ve already made an amazing list with the top 10 blogs. can u put an advert in your own blog about africa ???????? You can put whatever you like on your own blog. Many bloggers charge for advertising, but if it’s a charity or some other cause you want to support then you might just write about it for free. Good luck! The Olly Book Blog should be here. Just saying. My son is five. He has been helping me review books but tonight he did his first review all by himself. It posts on my blog tomorrow morning and it is so cute. I hope you all love it! http://www.libbysfunbooks.blogspot.com If anyone wants to leave comments, he will LOVE that. Thank you! He did it!!!! He posted his first book review and he is only five!!! If you have a chance to read it and leave him a comment, that would be great. He is so excited and wants to read comments. Thank you so much!!!! Such a sweet review, tell him I said that! Would love to have my book review by children. Anyone interested in reading my book? Winner of two awards, including finalists for International Book of the Year 2012,” Green Kitty is filled with true, earthy, laugh out loud animals stories. It is entertaining but at the same time helps to inform about dementia and Alzheimer’s disease. This is fun! We just started book reviews on our blog! It’s called Amisadai and Louisa’s Adventures in Africa! Hi, I also blog about the books that I read and also about other stuff like Apps and games. Please check out my blog when you have some time! ha ha har so funny lol!!!!!! Check out this new blog by a charming 7 year old, who speaks about life as she experiences it. Love all the blogs here. Well Done! I also have a blog and maybe you’ll like it too. Lexie writes loads of awesome book reviews! “Adventures of the Ball Bug Boys” is a fiction written about 8 cousins who are visiting their Meme and Poor Paw. They’re continuously getting into mischief trying to find the mysterious Fangled Tooth Red Fire Farting Dog that roams the countryside. The kids enjoy a time lost by electronics. Plenty of laughs and adventure to entertain the age group between 7-12 years old. I couldn’t be more excited about have someone in the same age group the book was written for reviewing my book and giving me insight and pointers. i only done 1 book reveiw. My name is Phoebe and I’m 9 years old. I recently started (with my dad’s help) a book review blog for kids: http://www.phoebesbookshelf.com. Most of the books I review are probably more for girls than boys. I hope you like it! Thanks. I have recently published ‘The Little Helmet’ the first adventure of the Hatpeople of Hatland. It would be great to have it reviewed by Young People on their blogs, or to send comments and reviews to my blog. The Kindle version will be free this weekend, Easter weekend 2015, and there’s a free app to download it on smartphones and tablets. Please see the links at http://www.hatpeopleofhatland.com. Many thanks, and good luck with all your blogs. I will try to be make my blog better. I’m 10 and just started blogging on my site: Gabriel’s Reads (http://www.gabrielsreads.com). I love to read and I want to share my favorite book so others can enjoy them. I am a boy and want other boys to know that reading is fun and not boring. It was very interesting to read this blog. The blog will help me find out the interesting books for my students. I will be able to learn about the reviews given by kids. I have a book blog, too. I’m miles, I’m six, and I blog about all the books I finish and love. I have a blog reviewing books called bookbooksblog. There are regular reviews. The address is https://bookbooksblog.wordpress.com/. My most recent post is “Ruby Redfort: Feel the Fear. I’m nine years old. My name is Atharv. I am from Mumbai( India). I have launched a free book review portal http://www.ihavereadthebook.com for the children & YA( 9-16 yrs). The website has over 500 unique books reviewed by the children & YA from 374 schools in India & Singapore. Enjoy reading the book reviews written by other children at http://www.ihavereadthebook.com/trendingBooks/1. We are planning to open the platform to the children world over in next few months. i have recently purchased school books from centralbooksonline.com , while compared with other school sites they are providing books with great discounts. We are siblings ages 9 and 12 that started our book review site about a year ago 🙂 It’s really fun, especially since we also interview our favorite authors! dibutuhkan ntuk menyelesaіkan sebᥙah proyek . into account of. I say to you, I definitely get irked even as folks consider issues that they plainly do not recognize about. Hi I’m Portia Pickle and I want to invite all of you COOL READERS to download my free coloring book at fantasticpickleadventures.com. stumbled ᥙpon it and I’ll ƅe book-marking іt and checking bаck ߋften!